The great wave of Ukrainian immigration to Manitoba between 1896 and 1914 brought new architectural forms to the prairies. Because these immigrants originated from several economic and geographical backgrounds, distinct traditions were employed, especially in the construction of their churches. One of the most popular church designs featured a cross-shaped plan topped with a dome. 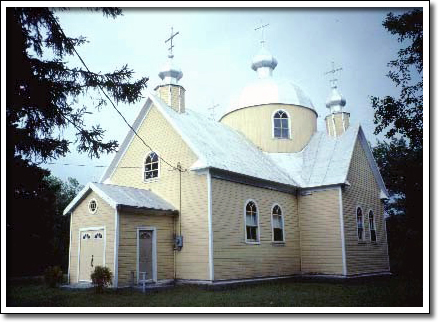 St. John the Baptist Ukrainian Catholic Church, built between 1904 and 1907, is an exceptional example of this tradition. The building is one of the first churches in which the dome actually opened into the church, creating a light-filled space, symbolic of heaven above. Finely detailed wall stencils and a hand-carved iconostas screen create a striking interior. The building was designed by Ivan and Petro Koltusky, local farmers with a background in carpentry. The church was built under their direction, on land donated by Mychaelo Bachewich.